Wherever grapevines are cultivated, this book will be welcome because it fills a long-standing need for a clear, concise treatment of modern viticulture. During the past fifty years, more progress has been made in the science and art of growing grapes for table use and raisin or wine production than in any previous century. This new edition has been revised throughout. The chapters on vine structure, vine physiology, the grape flower and berry set, development and composition of grapes, and means of improving grape quality add to our knowledge of the vine and its functions. The text is designed to enable those concerned with either vine or fruit problems to arrive at considered diagnoses. The student will find the text and the cited references a comprehensive source of information. The grape and allied industries should welcome the updating of the major portion of the book. Here the emphasis is on modern practices in vineyard management in arid and semi-arid regions—with special reference to California. Full and detailed treatment is provided or propagation, supports, training young vines, pruning, cultivation and chemical weed control, irrigation, soil management, diseases and pests, and harvesting, packing and storage. The practices recommended in the book are based on the extensive research conducted in California and elsewhere by the authors and their distinguished colleagues. Examples of practices based on experiments are: methods of propagation which by-pass the usual one-year-in-the-vine-nursery; pruning as related to leaf area and time of leaf functioning, and its effect on berry set and fruit development; virus disease control through thermotherapy and soil fumigation; pests held in check by sanitary, chemical, and biological procedures; irrigation practices as related to soil texture. Tissue analyses are employed as guidelines indicating the mineral deficiencies or excesses of vines. Machine harvesting of raisins (with cane cutting) and some wine grape varieties with problems are described. The regional recommendations for table and raisin varieties are based on log years of observations, while those for wine grapes are the results of studies of the interrelation of variety and the heat summation of the different climatic areas. 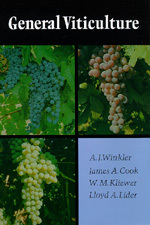 No one concerned with the cultivation of grapes can afford to be without this book. The authors have all been members of the Department of Viticulture and Enology, University of California, Davis—a world-renowned research center.